Hand & Body Lotion,Coconut Milk & Honey by JR Watkins smells wonderful and feels good; makes my hands feel soft, if only for the moment, since my hands need a lot of TLC. 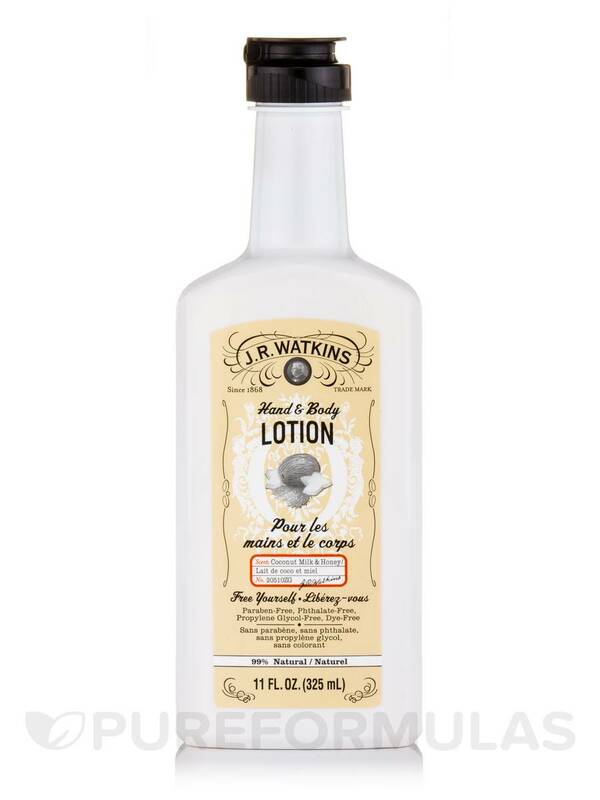 Keep your body's delicate skin soft with J.R. Watkins Hand & Body Lotion. This rich‚ every-day formula contains ten essential oils and plant-derived extracts to give your skin deep‚ long-lasting moisture. A combination of shea & cocoa butters softens skin in the driest of conditions‚ leaving it naturally smooth and nourished. Water/aqua/eau‚ Prunus armeniaca (apricot) kernel oil‚ glyceryl stearate‚ Butyrospermum parkii (shea butter)‚ Theobroma cacao (cocoa) seed butter‚ cetearyl alcohol‚ fragrance/parfum*‚ sodium stearoyl lactylate‚ glycerin‚ Cocos nucifera (coconut) oil‚ Persea gratissima (avocado) oil‚ phenoxyethanol‚ allantoin‚ Orbignya oleifera seed oil‚ Simmondsia chinensis (jojoba) seed oil‚ panthenol‚ Calendula officinalis flower extract‚ Chamomilla recutita (matricaria) flower extract‚ Tilia cordata flower extract‚ Centaurea cyanus flower extract‚ Anthemis nobilis flower extract‚ Hypericum perforatum extract‚ tocopheryl acetate‚ Cyamopsis tetragonoloba (guar) gum‚ Aloe barbadensis leaf juice‚ potassium sorbate‚ benzoic acid‚ dehydroacetic acid‚ citric acid‚ sodium hydroxide. 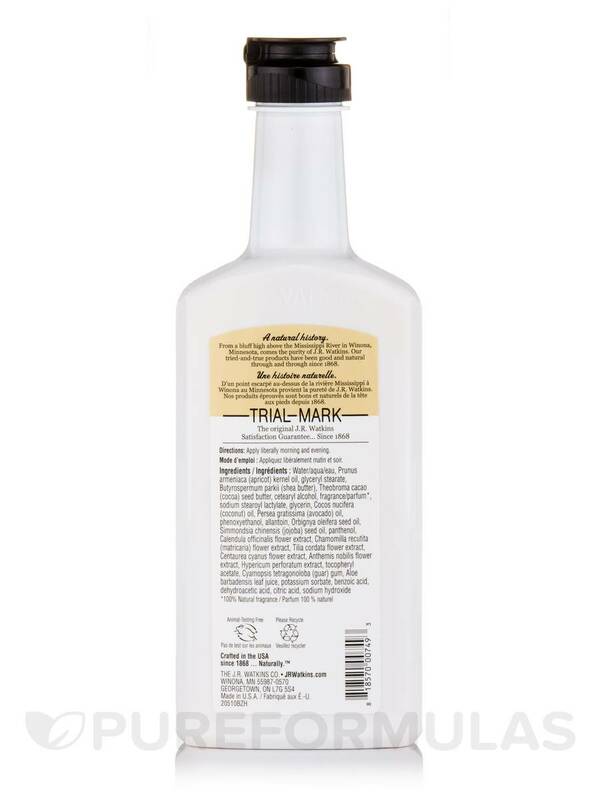 Animal-Testing Free / Paraben-Free / Phthalate-Free / Propylene Glycol-Free / Dye-Free. Creamy consistency, wonderful lasting fragrance, and it looks like I will be able to empty the bottle without the usual struggle to get the last few drops (I"m cheap). It doesn't work as well as Cetaphil, which is the only lotion I have ever used that keeps my heels from cracking in the winter, and saved my skin post-radiation therapy. But it's still nice. Everybody can't be Cetaphil. and I like the whimsical little picture on the bottle. The combination of coconut oil and honey produces great results. 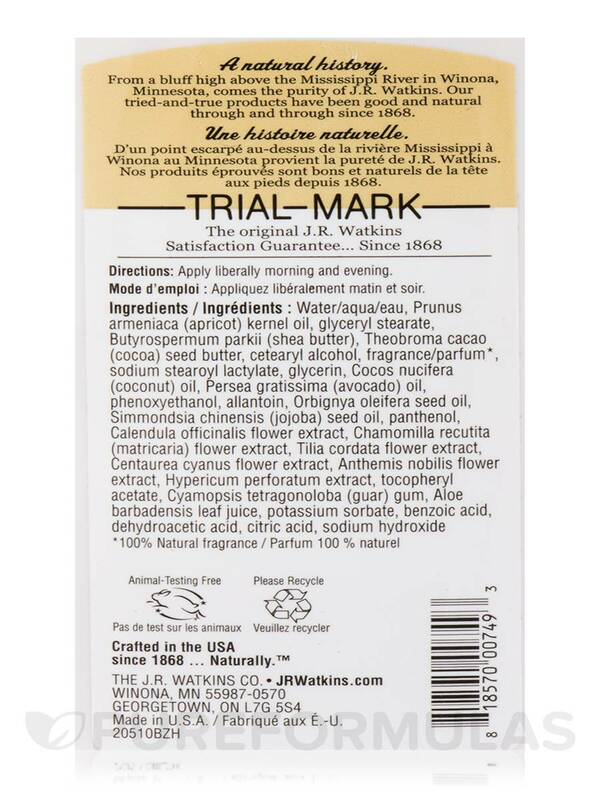 Hand & Body Lotion, Coconut Milk & Honey by J.R. Watkins is amazing and great results are guaranteed!